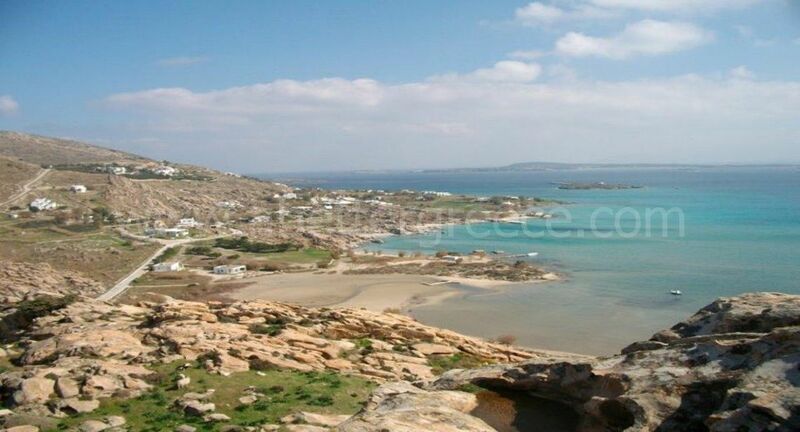 Two sea front houses located in Ambelas - Naoussa on Paros. The first house offers 3 bedrooms, two bathrooms, a large fully equipped kitchen, a living room, a dining room an office room and a large veranda with a panoramic sea view.The second house offers one bedroom, a living room, a fully equipped kitchen, a living room, a bathroom and a veranda with a panoramic sea view. Description of the villas The two villas are identical: Each villa is 68 m2 and surrounded by a well kept garden with a private parking space. 115 sq. meters 2 floors, garden 400 sq m.) faces south, very closed to Lolantonis beach . Ground floor: an open fitted kitchen, with a storage, a dining room and a sitting room, a bed room with 2 single beds a bath room (shower) 1 toilet. A balcony and a terrace with sea view, a car park in front and a large space behind the house with a garden and hill view. A large, independent comfortable countryside villa of 145 m2, located in a quiet, peaceful area just 500 meters away from the center of Paroikia and 600 meters away from the beach! The villa can accommodate 8 people as it offers 3 large bedrooms and a huge living room with sofa beds. The establishment consists of 3 stone built luxury houses and is located is located 300 meters away from the famous Krios beach and 2 km away from Parikia the port and capital of Paros Island in a 4000 square meter land offering amazing views to the beautiful bay of Parikia and the sunset. Sea Dream Villas are a newly built apartment complex situated a few meters from the sea, in Ambelas - Just 2 km outside Naoussa, on the Cycladic island of Paros, Greece. Stylish apartments for 2 and 4 persons, all with sea view, air conditioning , TV, WiFi & Hi-Fi. Each building can accommodate 2-4 guestsVillas Georgy is a small recently refurnished complex in a well-kept garden of flowers and trees, offering relaxation in the shade and hours of carefree play for children. The old town and port are within easy reach either by car or an enjoyable 25 minute walk along the seafront where there is an assortment of restaurants, cafes and shops. A small villa of 67 m2 that offers one bedroom, a living room with 2 sofa beds, a fully equipped kitchen and a bathroom. Large furnished verandas offer a beautiful sea view and the villa is very very private. A small apartment with a swimming pool that is located just 1,5 kilometers away from the famous kite surfing beach on Paros island. The apartment offers one bedroom, a private bathroom, a living room with two sofa beds inside, a small fully equipped kitchen and a large yard with a barbecue and a swimming pool.